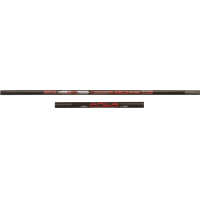 Competitive cross rod in ultra-modulus carbon, fast and stiff action, perfect balance. Delivered in a PVC protective tube + 2 mini extensions. Numbered sections, first section and top telescopic, non-slip handle.